Do centipedes really have 100 legs? | What can I learn today? I was reading a story today about some of the weird ways Australians die. And it turns out that big-ticket dramatic endings are much more common on the small screen than in real life. For example, if you’re the type of person who worries endlessly about crocodiles, earthquakes or avalanches, you should rest easy. In fact you’re more likely to die from such activities as falling out of bed or being bitten by an urticating caterpillar or other venomous arthropod. Now, I can’t explain why, but the word caterpillar triggered a quest for knowledge. Specifically, the question of whether centipedes really do have 100 legs, as common wisdom holds. And the answer, somewhat surprisingly, is no. In fact, some have as few as 30, or 15 pairs. They’re detailed more in this Museum Victoria article or this article at Animal Planet. And here’s one final fact that caught my eye, from About.com. Centipedes do not have 100 legs. Though their common name means “100 legs,” centipedes can have significantly less or more than 100 legs. 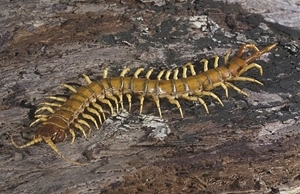 Depending on the species, a centipede can have as few as 15 pairs of legs, or as many as 171 pairs. Regardless of the species, centipedes always have an odd number of leg pairs, so they never have exactly 100 legs (because 50 pairs is an even number). Guess you can never assume common wisdom is correct. ← Why did they recast Buttercup in The Hunger Games: Catching Fire?